Starting the day with a smile, some days it’s just made easier. On opening the curtains it’s not only sunny, but there’s fresh snow on the mountains! And quite a lot of it, even below the tree line. It’s mid February. Theoretically that means it’s mid summer; something that doesn’t impress the weather gods much here at these southern latitudes. I am sure few people share my enthusiasm on today’s snow. Thinking my hiking friend Alejandra might, I send her a message: let’s climb a mountain! I buy some bizcochos for the trail and head up to Ale’s. We chat, have coffee, chat some more and fix my hiking boots with some duct tape. It’s getting late. 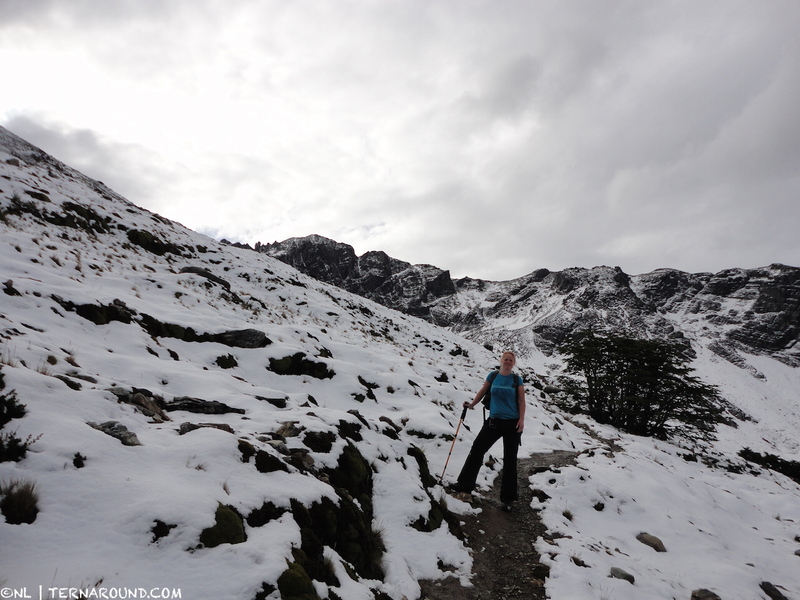 Off we go, it’s 4.30 p.m.
Summer hiking in fresh snow on Cerro del Medio. We choose to hike Cerro del Medio, the middle mountain. If you are in Ushuaia and you want to climb one mountain – easy accessible and free – this is your mountain! From the port in the town center it’s a straight road up Laserre street. Crossing Alem to the left you see a trail going up to Cerro del Medio. The first part climbs slowly through a forest of lenga trees. Some parts are wet and muddy because of yesterday nights’ heavy rains. Some parts remain wet and muddy however, as I can tell by the provisional arrangement of tree trunks on the trail. Personally I always find it funny how people make an effort to keep their boots clean. They’re meant to be used, right? The trees become lower and more dispersed when getting closer to the tree level of about 750 meters. Alejandra points out where we have to go. In front of us are the so-called Martial mountains. I now understand why it’s called the middle mountain. It’s actually a solitary rocky mountain in front of the range. Behind and far below me is Ushuaia. From here it’s location, directly on the Beagle Channel and surrounded by mountains, can really be appreciated. It’s quite perfect. 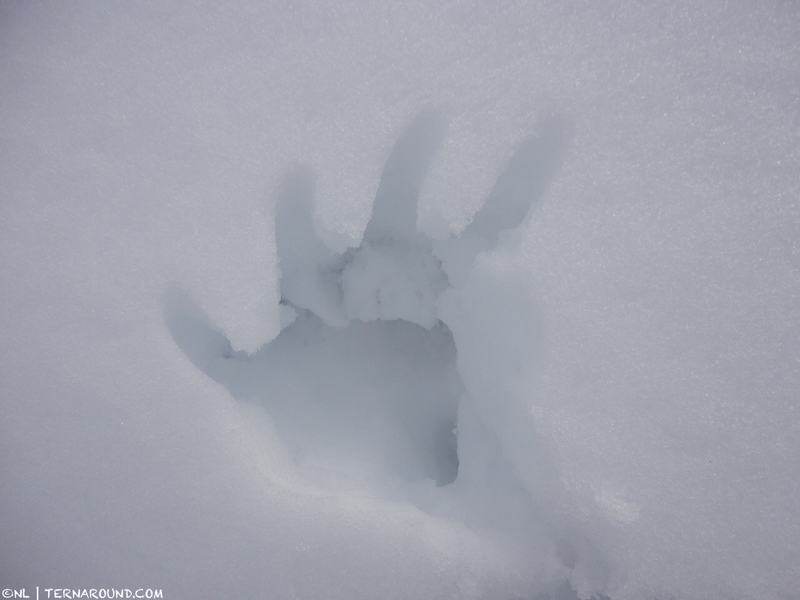 Leaving some handprints in the snow. Clouds are coming in on the mountains and the channel while we climb further up on the trail. Although the air is fresh I am still hiking in a t-shirt. Yet we made it to the snow! Suddenly a shout comes our way. We look up and wave back at a guy who made the summit. He’s our first living soul to see for the day. We get to a shallow lagoon and encounter some winds. The landscape can be best described as barren. I love it. We climb over dark rocks partly covered in snow and make a final short climb up to the summit. It sure is cold and windy now, but we find a place to shed ourselves a bit to be able to eat some, drink a tea and enjoy the view. Below to the right is the road up to the Martial glacier, a more well-known spot to enjoy the extended views over Ushuaia and the Beagle Channel. 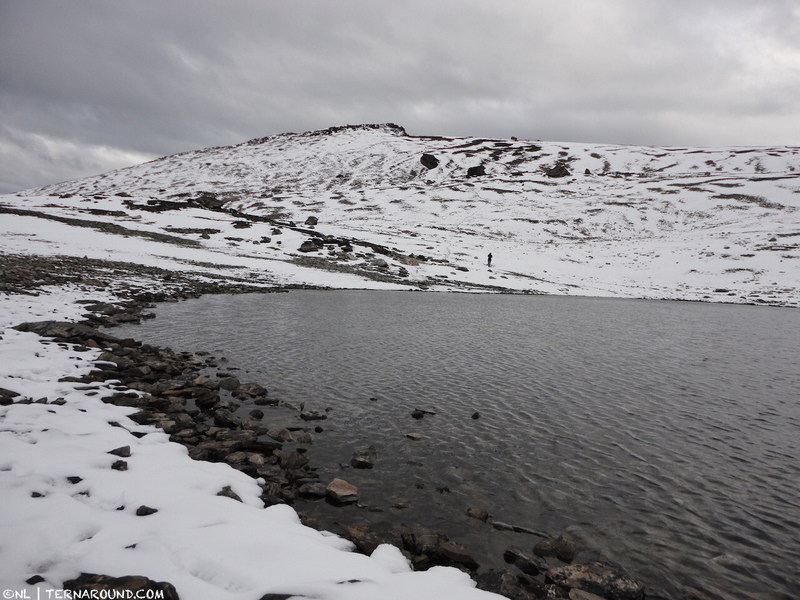 A cold lagoon in a barren landscape. Our break is short. We take some pictures and take in the gorgeous view of the mountain range, Monte Olivia and Cinco Hermanos and the foothills slowly ending in the Beagle Channel. The views to the east are extended and awesome. It’s 7.30 p.m. We figure it will take us some 2 hours to get down. The summer nights are long, but we probably won’t make it all the way in daylight. Time to head back. We take the shorter but steeper and more complicated trail back. The snow at some places reaches up to our knees now, slowing our going. Once we get to the forest the trail is marked and easy to follow. By the time we get to the outskirts of town it’s almost dark. A hot shower and fresh pastas await us. One strong advice: leave earlier, bring flashlight anyway! This entry was posted in (Hitch)hiking, Ushuaia and tagged Argentina, day hike, Patagonia, Tierra del Fuego. Bookmark the permalink.